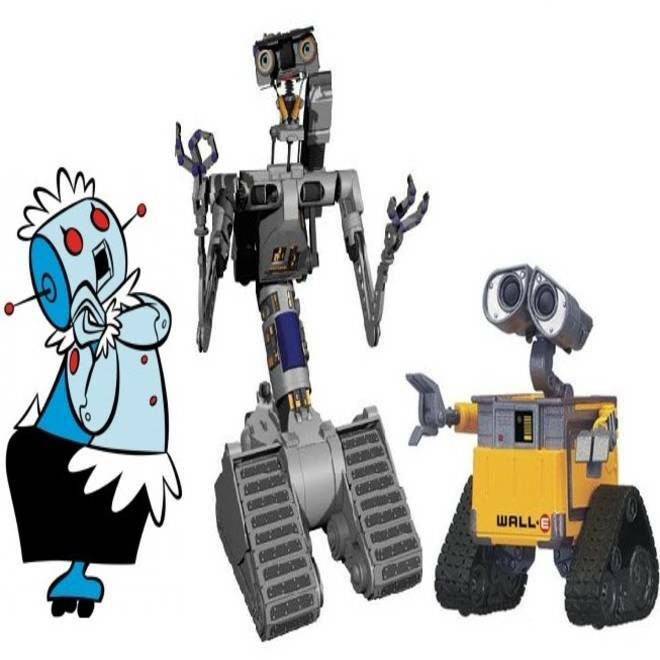 Rosie of "The Jetsons," Johnny 5 from "Short Circuit" and WALL-E are vying for a place in the Robot Hall of Fame. For the past nine years, the Robot Hall of Fame has relied solely on expert judges to dole out its honors — but this time, the people will get their say. Should Rosie, Johnny 5 or WALL-E join other robotic greats such as R2-D2 and C-3PO in the hall of honor? This competition isn't just for fictional robots: Internet voting is being conducted to select robot laureates in four categories, from a field of 12 nominees. The idea of factoring in the popular vote is a first for the Robot Hall of Fame, which was created in 2003 by Carnegie Mellon University in Pittsburgh. "The technology and art of robotics are advancing at an increasingly rapid rate, and so the Robot Hall of Fame also must evolve," Shirley Saldamarco, the hall of fame's director and a faculty member at Carnegie Mellon’s Entertainment Technology Center, said in an announcement kicking off the voting. "As more students, workers and consumers become accustomed to robots, it seems like a natural step to give the public a voice in selecting inductees." The 12 finalists were nominated by 107 robotics experts, industry leaders and robo-aficionados. You can cast a ballot for one robot in each of the four categories by stepping into this online voting booth, between now and Sept. 30. The popular vote will be factored in with a survey of the robotics experts, on a half-and-half basis, to determine the winners. The newly chosen robots will be inducted into the Hall of Fame on Oct. 23 at the Carnegie Science Center in Pittsburgh, in conjunction with the RoboBusiness Leadership Summit. "We love robots, and we love to see their inventors and creators get the public recognition they deserve," summit chairman Dan Kara said. The October induction ceremony also will pay tribute to the 2010 class of Hall of Fame robots: NASA's Spirit and Opportunity rovers, iRobot's Roomba vacuum cleaner, the da Vinci surgical system, the three robots from the film "Silent Running" (Huey, Dewey and Loui) and T-800, the character played by Arnold Schwarzenegger in the "Terminator" film series. To get more information about the ceremony — and to buy tickets at $99 a pop — check out this Eventbrite webpage. Aldebaran Robotics' NAO, a 22-inch-tall humanoid that is widely used in education (and robo-soccer games) worldwide. iRobot's Create, a programmable robot based on the Roomba vacuum cleaner design. VEX Robotics Design System, a kit for designing and building robots for the classroom and for competitions. WALL-E, the waste-collecting robot that's the hero of the 2008 animated film of the same name, presented by Pixar and Disney. Johnny 5, a prototype military robot that learns to reject destruction and embrace life in the 1986 movie "Short Circuit." Rosie, a robotic maid with a mind of her own who took care of her human family on "The Jetsons," a 1960s animated sitcom from Hanna-Barbera. iRobot's Packbot, which takes care of bomb disposal and other dangerous assignments for the U.S. military. Jason, a remotely operated vehicle built by Woods Hole Oceanographic Institution to explore the deep ocean. BigDog, a four-legged robot that's being developed by Boston Dynamics for the Defense Advanced Research Projects Agency to walk, run or climb over rough terrain with heavy loads. PR2, a two-armed robot built by Willow Garage that can navigate human environments and has the dexterity to grasp and manipulate objects. Robonaut, a dexterous, two-armed robot developed by NASA and GM to help humans work in space. The latest version, Robonaut 2, was delivered to the International Space Station last year. 2010: Spirit and Opportunity; Roomba; da Vinci; Huey, Dewey and Louie; T-800 Terminator. 2008: Commander Data, the Raibert Hopper, NavLab 5, Lego Mindstorms robot kit. 2003: HAL 9000, Mars Pathfinder's Sojourner rover, R2-D2, Unimate. That still leaves plenty of robots to nominate, including the newest star, NASA's Curiosity rover. Feel free to pass along your own People's Choice picks, or take issue with the Hall of Fame selections that have been made so far, by leaving a comment below.